President Trump borrowed a page from George W. Bush's playbook Monday by nominating 10 federal court judges en masse, almost 16 years to the day that Bush named 11 appeals court judges — including a Washington lawyer named John Roberts who soon became chief justice of the United States. Trump's action represents the opening salvo in what will be at least four years of battles with Senate Democrats over the federal judiciary, one that the president intends to pack with conservatives after President Barack Obama spent eight years tilting nearly every circuit court to the left. It also elevates some rising legal stars who made it on to Trump's original list of 21 potential Supreme Court justices last year, putting them closer to the nation's high court...Two judges from that list were among the 10 nominees named Monday. (1) This sort of action is not unprecedented, as described in the article. The John Roberts nugget is especially noteworthy because Roberts went from the private practice to the DC Circuit Court of Appeals to the US Supreme Court as Chief Justice over the span of a few short years. Roberts was confirmed to the lower court in 2003, then elevated to the High Court two years later. It's also worth pointing out that Senate Democrats obstructed Roberts' first judicial nomination under President George H.W. Bush in 1992, then again refused to give him a hearing under President George W. Bush in 2002. He finally advanced when Republicans regained control of the Senate in 2003. Obama has already appointed 329 judges to lifetime jobs, more than one third of the judiciary, and they’re already moving American jurisprudence in Obama’s direction. He got two left-leaning women onto the Court: Sonia Sotomayor, the first Hispanic justice, and Elena Kagan, his former solicitor general. He also flipped the partisan balance of the nation’s 13 courts of appeals; when he took office, only one had a majority of Democratic appointees, and now nine do. Thanks to the Reid Rule, expanded by McConnell this spring in retaliation for yet another unprecedented and unilateral escalation by Democrats, judicial nominees can now be confirmed with a simple majority vote in the US Senate. Republicans should schedule hearings and confirm as many nominees that Trump can send them over the course of his first term -- especially with Democrats powerless to stop them, thanks to their own actions. Reversing the damage Obama and Reid inflicted after executing their power grab is essential. Two judges from that list were among the 10 nominees named Monday. 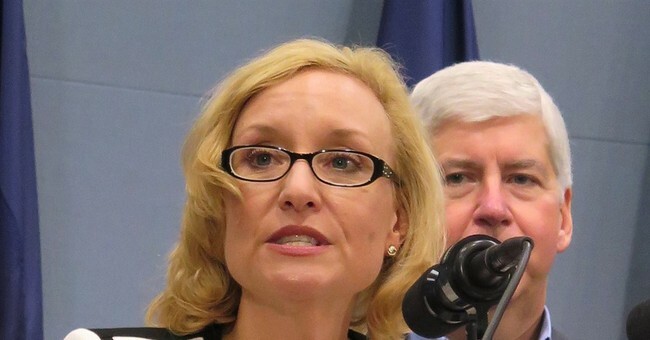 Joan Larsen, 48, a Michigan Supreme Court justice, was nominated to serve on the U.S. Court of Appeals for the 6th Circuit. David Stras, 42, a Minnesota Supreme Court justice, was nominated for the 8th Circuit. Previously, federal district court Judge Amul Thapar of Kentucky, who also made Trump's high court list, was nominated to the 6th Circuit. My hunch is to keep a close eye on Joan Larsen (pictured above). Here's why: If Justice Kennedy retires either this summer or next (as expected), Trump should probably feel free to choose whomever he'd like to fill that seat. It's a white man retiring, so identity politics may not be much of a factor in finding his replacement. The Left will pitch a fit regardless, of course, due to Kennedy's 'swing vote' status. They'll argue that picking a conservative to fill that slot would alter the ideological balance of the Court -- and they'll be right. But that's precisely what Hillary Clinton vowed to do if she'd won, by swapping in a progressive for Scalia. Democrats would have cheered. Also, if the Kennedy vacancy was going to be the go-to-the-mat battle, perhaps Chuck Schumer and friends should have strategized more carefully before they foolishly and baselessly triggered a nuclear confrontation over Gorsuch. Their leverage is now gone. Anyway, setting aside Kennedy's timing, let's say Ruth Bader Ginsburg -- who is well into her 80's and has confronted several health challenges, were to leave the Court between now and the completion of Trump's first term. There could be significant pressure to pick a woman, partially due to political and identity-related optics. That's where Larsen might come in. She's a former Scalia clerk, a member of Michigan's state Supreme Court, and a professor at the University of Michigan's prestigious law school, who graduated first in her class from another elite law school, Northwestern. And assuming she emerges from her confirmation process, she'll soon be ensconced on the sixth circuit court of appeals -- all before the age of 50. Given those factors in her favor, Larsen may eventually prove to be a highly attractive candidate for a future SCOTUS vacancy. In the meantime, all eyes are on Anthony Kennedy as the Court's current term comes to close next month.